As the Lead Facilitator for Driver’s Edge, the guy known as “Reverend Mike” will teach you more than you thought you’d ever know about lots of things you never thought you’d learn. His unique approach is both entertaining and instructive, with an ability to connect with people of all ages as he conducts the Vehicle Walk-Around and Car Care Modules at Edge events. “The Rev” brings both industry experience and life experience to Edge, with a long background as both a driving instructor and facilitator. Over the last decade, Mike has spent a large percentage of his time on the road working with the top driving schools in the country, including the Skip Barber Driving School. 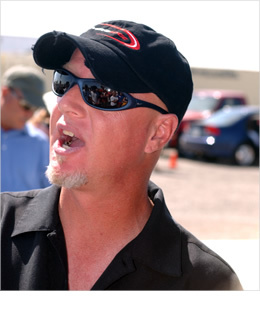 Mike has played a key role in countless auto manufacturer rollout and promotional programs, including events for BMW, Dodge, Mercedes, Nissan and others. Mike’s unique rapport with both students and parents makes him an invaluable part of the Edge team.